Kuan Yin, or Guan Yin, is the East Asian bodhisattva of compassion, who is usually represented in female form and is commonly identified with her male aspect or counterpart, Avalokiteshvara. Her full Chinese name, Kuan Shih Yin, meaning 'She who beholds the cries of the World', was originally derived from Avalokiteshvara's Sanskrit name, and she likewise has a hundred-and-eight different names and aspects. She is also popular in Japanese Buddhism, where she is known as Kannon, but some of her Chinese legends equate her with an early Daoist goddess known as the 'Queen of the West'. 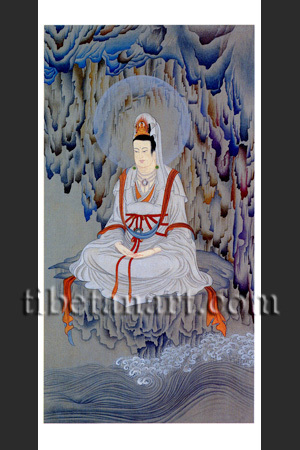 Kuan Yin appears here in her aspect as the 'white-robed goddess of the rock cave', as she sits upon the rock promontory of her ocean cave on P'u-To Island off the Chekiang coast of China. This sacred island derives its name from the Sanskrit tem Potala, which is the name of Avalokiteshvara's Pure Land or paradise, and also of the Dalai Lama's mountain-palace in Lhasa, Tibet. Kuan Yin sits serenely with her two hands resting upon her lap in the dhyana-mudra of meditation. A small image of Amida Buddha (Amitabha) adorns her crown, as Amitabha is the 'Lord of the Padma or Lotus Family' to which she belongs.